Your Weymouth home should be the safest place for you and your family, and you can keep it as safe as possible by keeping its electrical components in great shape. To keep your Weymouth home's electrical setup in the best possible condition, call the experienced Weymouth electricians at MacEwan Electric for your electrical needs. Do your lights flicker? Do certain outlets not work? Does your breaker flip regularly? If any of these happen within your Weymouth home, you're in need of electrical repairs. 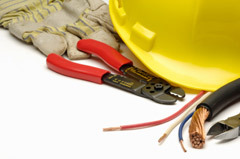 And in the area, your dependable electricians at MacEwan Electric can provide quick yet thorough electrical repairs that will keep your home as safe as can be. As your family grows, so will the demands it puts on your electrical panel. Once your demands grow large enough, your Weymouth home's electric panel could become overloaded, and this could lead to safety issues. To keep your home as safe as can be, call us for a panel upgrade when you need one. If you are looking for a professional Weymouth area electrical contractor, then please call us today at 617-688-8171 or complete our online request form.